At the funeral, they played music & danced, as is tradition in the region where the family is from (they are Bakhtiyari Lor from the Zagros Mountains of Fars). One hundred shots were fired over the graves. Music, dance & arms, despite the presence of regime forces. During the funeral procession, there were banners & posters for the boys lining the streets. There was also a videographer there to record the funeral. The regime’s security forces didn’t dare come close while the funeral was ongoing; they watched from a distance. During the funeral, the mother of Mohammad and Abdollah Fathi, who struggled to keep her sons alive, has been arrested by Islamic Republic forces. The videographer & the person who fired the shots over the boys’ grave have also been arrested by this murderous & barbaric regime. We condemn this barbaric regime’s arrest of the woman whose sons were brutally executed by the Islamic Republic murderers yesterday. Down with the Islamic Republic! Long live freedom and humanity! 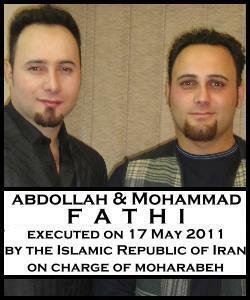 « Protest the Executions of Mohammad & Abdollah Fathi! No Peace for the Islamic Republic of Murderers! Mohammad and Abdollah were not executed but killed unlike all the others in the last 32 years they are all martyrs. Rest in Peace, you shoult not vorgotten. On the Cross Jesus cried: Oh father forgive them, they dont knowing what they are doing. I am saddened by the news of the execution of these two innocent brothers. My heart goes out for their parents. I am interested in knowing what has happened to the mother? Has she been released from the Islamists’ jail? Yes, their mother was released, and has since fled the country.